One does not have to speak Spanish to understand the scope and importance of this excellent TV coverage of the activities of ARCWP priest Olga Lucia Alvarez Benjumea in Colombia, South America. 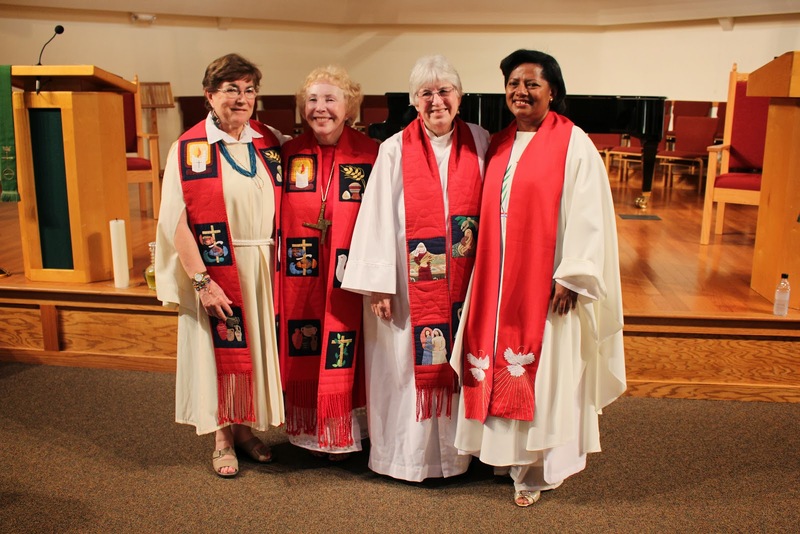 Also included as she ministers to her people, is woman priest Martha Aida Soto Bernal.The Ordination of priest Marina Teresa Sanchez Mejia in Sarasota Florida is included. All three are from Colombia- from Medellin, Bogota and Cali. We are blessed to have these women of deep faith and courage as our sisters in the Association of Roman Catholic Women Priests. Olga Lucia shares that there are over 180 in the women priest movement and this is growing daily. She says that from her baptism she was called to be a a priest and man-made rules cannot change this calling. She says that “excommunication” which is a form of “self-excommunication” means nothing as she has not broken herself off from the church or from the people of God whom she serves. She shares her ministry and we see her baptizing a baby, serving the Eucharist , preaching, relating warmly to children and families and doing the things that all priests do with love and joy. Let us remember that Pope Francis, from Argentina, speaks Spanish fluently and may be watching this video right now. If so, he will see the love and affirmation Olga Lucia gives him as a Pope of the poor. If he reflects and searches his heart and conscience this Lenten season he may also find the mandate from the people and from his own heart, and the courage to ask for change in the rules made by men in the 12th century. This is not expected or needed but it would be a great surprise to the people of God. Olga Lucia was ordained in Florida in December of 2010. Martha Aida Soto Bernal was ordained in Colombia in March of 2011. And Marina Teresa was ordained in Florida in January of 2014. There are other candidates from South America who will likely be ordained this year. We are so thankful for our South American sisters who are leading the way in Latin America.